There won’t be any updates here for a week or so, as I’m off to Southern California for the annual Lone Pine Film Festival, which begins Thursday evening with a star-studded cocktail party at the town’s Film History Museum. As usual, I’ll be moderating several panels, and this year the Museum is adding one in which several movie historians (including me) will discuss the process of researching and documenting our cinematic heritage. 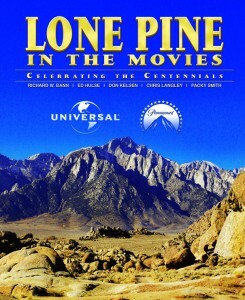 Of course, I’ll also be plugging the 2012 issue of Lone Pine in the Movies and Murania’s own Western Movie Roundup. No horseback rides in the hills this year; insurance rates have shot up and the price of renting horses has risen accordingly. Will report on the Festival (and other things) when I get back. There are lots of things in the works and it promises to be an exciting Fall season.